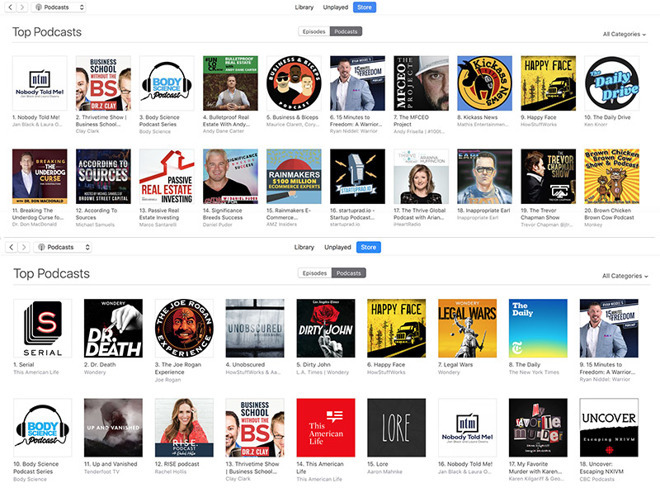 Last weekend, the upper echelons of Apple's "Top Podcasts" charts in the Podcasts app and iTunes were overrun with obscure titles that seemingly didn't belong, prompting some industry watchers to assume the vital distribution platform was being manipulated. In light of the incongruity, and a history of similar problems, podcasters and others associated with the medium took to social media to voice concerns that outside parties were cooking Apple's important charts. As noted by Business Insider, Apple does not host individual podcasts, at least those not published by company, but it does play a vital role in helping content makers find listeners. From iPod — podcasting's namesake — to the Podcasts app for iOS and iTunes Store, Apple plays an outsized role in steering listener tastes. What the App Store's genre-specific top charts does for apps, so does the "Top Podcasts" chart do for free, typically episodic, audio content. The effect is perhaps more pronounced with podcasts, as many listeners rely solely on Apple's charts and discovery features to surface new shows. For podcasters who make a living off advertising or podcast sponsorships, the platform is vital to their well-being. While industry stalwarts like "Serial," "Lore" and "The Joe Rogan Experience" routinely rank in the top-five of Apple's charts, the largely static landscape was clearly disrupted over the weekend. Real estate-themed podcast "Bulletproof Real Estate With Andy Dane Carter" sat in the top spot for some time, while other shows shot up to occupy coveted high-rated seats, Business Insider reports. The chart reverted back to situation normal on Tuesday — "Bulletproof Real Estate With Andy Dane Carter" was sitting at No. 91 as of this writing — suggesting Apple is aware of the situation and has taken action. The abrupt change caught the eye of industry watchers like Dave Zohrob, whose firm Chartable provides podcasters with data and analytics across a variety of top podcasting platforms. "We've been doing our own digging into the charts and have seen a highly unusual amount of manipulation in recent days," Zohrob told the publication. Zohrob and others believe Apple's charts are easily manipulated by unscrupulous publishers. In particular, podcasters looking for an extra boost can buy the services of "click farms" that use bogus iTunes accounts to falsely inflate listener numbers. Online marketplace Fiverr, as well as other outlets like Twitter, feature users promising to push podcasts into the top 20 or top 10 of Apple's charts for a nominal fee. "[I]t's easier now than ever before. for ~$50 there are 20+ fiverr [sic] accounts willing to get you into the top 20," Kevin Goldberg of Discover Pods said in a tweet. In an investigation into podcast chart manipulation earlier this year, Goldberg cast doubt on the click farm theory, noting many of the services exist outside of the U.S. and would thus not impact domestic podcast rankings. Goldberg believes a more effective method would be the creation of Apple IDs, perhaps through an automated script, and subsequent subscription to a desired podcast. Therein lies the crux of gaming Apple's charts. While the company has not revealed the methodology behind its rankings, those who monitor Apple's charts believe subscription numbers outweigh individual listens. The system dissuades boost-by-click, but is by no means infallible. Working off the premise that Apple charts rely — largely — on subscription-weighted rankings, a quick look at metrics can quickly reveal anomalies. For example, a spreadsheet shared by Zohrob demonstrates a number of shows reached high ranks over the weekend despite lacking user reviews or Top-400 episodes. Additionally, some podcasts that failed to release a new episode "in weeks" recently shot up Apple's charts, Zohrob said. Goldberg summarized segment sentiment on the issue in a tweet last week. "Podcasters, please stop using these charts as validation. Advertisers, don't base you rates on chart rankings. Listeners, there are tons of great podcasts out there, don't rely on these charts," he said.